This is seen as a possible follow on from Tiles in the Garden. So this one used $26$ and the slope was generated by going along $1$ and up $5$. This time let's put on a limit of using less than $100$ tiles. What sizes of rectangles could be filled obeying the three rules? 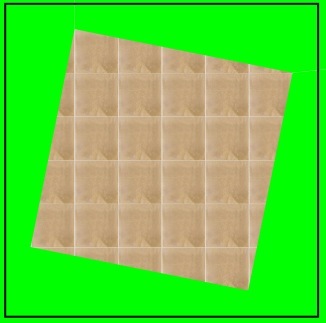 How many tiles for each rectangle you find? Are there any numbers of tiles between $10$ and $100$ for which there cannot be a rectangle? Practical Activity. Perimeter. Describing Sequences. Combinations. Area - squares and rectangles. Working systematically. Interlocking cubes. Surface and surface area. Addition & subtraction. Investigations.